Part of the reason for the drop in the Netflix stock price has been high volatility in the broader markets. Since Aug. 1, the Dow Jones Industrial Average is down 6.6%, while the Nasdaq is down 5%, and the S&P 500 is off 6.3%. But that's not the whole story. The NFLX stock price has also suffered as the company's competition continues to grow. In early September, Hulu decided to offer an ad-free subscription to its customers for $11.99 a month. While that's an increase from its traditional subscription service of $7.99, it could entice existing Hulu customers to spend extra. Amazon.com Inc. (Nasdaq: AMZN) is now allowing Amazon Prime customers to download television programs and movies, instead of just streaming them. The company also announced a partnership with HBO, allowing it to air some of the channel's retired series. While some may be looking at the 20% pullback as a buying opportunity, several other indicators show that NFLX stock is still expensive. Right now, Netflix's trailing P/E ratio is 230, according to Yahoo! Finance. For comparison, Apple Inc. (Nasdaq: AAPL) has a P/E ratio of 13.3, and Microsoft Corp. (Nasdaq: MSFT) has a P/E ratio of 29.9. Another good barometer for a stock's value is its price/earnings to growth (PEG) ratio. A PEG ratio of 1.0 is considered fair value for a company. Right now, Netflix has a PEG ratio of 21.7. The Bottom Line: The NFLX stock price is down again today, continuing a sell-off of nearly 20% in the last two months. 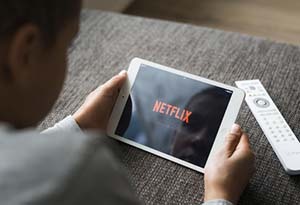 NFLX stock has been impacted by market volatility and increased competition. While Netflix stock is more affordable now, it is still one of the most overvalued stocks on the market today.